In today’s fast-paced world, it’s tempting to go with the option that provides instant gratification. Sometimes it feels as if we barely have enough time to unwrap a granola bar for lunch, let alone make a family meal from scratch. But when it comes to buying furniture, purchasing pieces from a chain retail store often means sacrificing comfort and durability, and ends with dropping that impulse-buy couch at the dump after only a few years of use. Taking the time upfront to choose thoughtful, quality-made pieces that are built to last is not only beneficial to your space, it’s better for the environment and can actually save you money and stress in the long run. How does it save you money? The pieces aren’t necessarily less expensive than the big box stores, but lines like our Design Studios Private Label were designed with sustainability, quality materials, and customized craftsmanship at the core of its mission. You can also create 100% custom, one-of-a-kind upholstered pieces that last a lifetime, which means you will have to buy less pieces over time, and ultimately realize savings. But don’t take our word for it, here, we provide four reasons why our Private Label is the best choice when picking your next signature sofa, recliner, chaise, bar stools or headboard. According to the EPA, furniture is the number one least-recycled item in a household, and furniture waste accounts for millions of tons of trash each year. We don’t believe in filling landfills with the disposable furniture that’s being sold at a lot of retail stores. Crafted by a premier furniture manufacturer, our Private Label furniture is made with solid hardwood (not the particle board or plywood often used commercially) and is built to outlast wear and tear, so your custom-made chair can survive multiple moves and generations. That’s something we can all stand behind. You don’t want to wear the same dress as someone else at the party, so why would you want the same exact sofa your neighbor has? We work with you from the very beginning to tailor each piece of furniture to your space, family, and style. With our Design Studios Private Label line, customers can choose from thousands of fabric options in a variety of textures and patterns, and can customize each piece down to the type of cushion and shape of the armrests. In addition, customers can provide specific measurements for furniture that fits perfectly in every nook. This results in a meaningful, one-of-a-kind piece that’s bound to be a conversation-starter. Always made in the U.S.
We proudly partner with a U.S. manufacturer that’s been crafting quality furniture in North Carolina for more than 15 years. They work with quality materials from the inside out: solid hardwoods, comfortable foams and feathers, and hand-tied coiling for extra durability. You can’t beat American made. While we’re committed to providing clients with timeless furnishings that they’ll love for years to come, we also realize that the style you love now might not be your style for life. That’s why with our Private Label line, we offer full reupholstering services so you can switch to a fresh fabric just in case you outgrow the pattern or color you pick now. Eco-friendly. Exclusive. American made. Timeless. Need we say more? 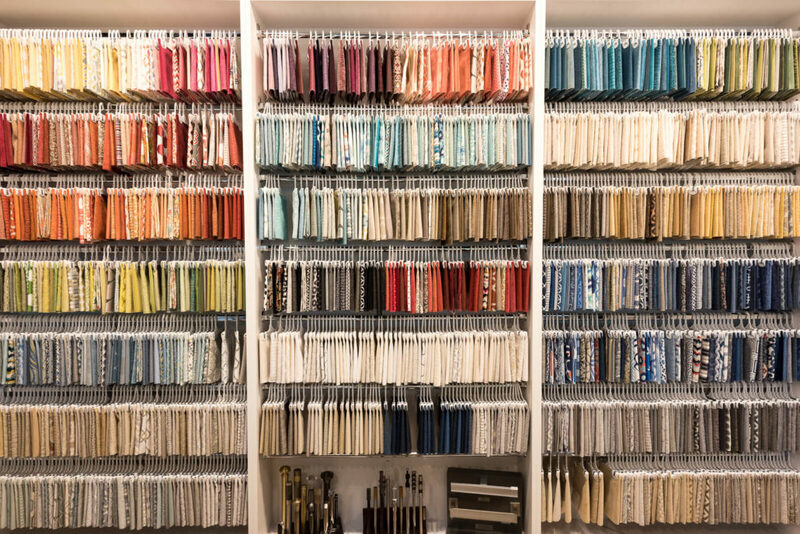 For more information about our Private Label line, call us or stop by our 6,000-square-foot showroom in north Boulder, where one of our skilled designers will walk you through each step of the process—from helping you select a custom fabric or finish that exemplifies your style and suits your budget, to scheduling a home delivery date. Let’s make your dream space a reality.